I like lots of mincemeat in my tarts and sometimes find that the small tarts tend towards an overload of pastry and not much mincemeat whereas a nice big tart means that it's mostly filling. 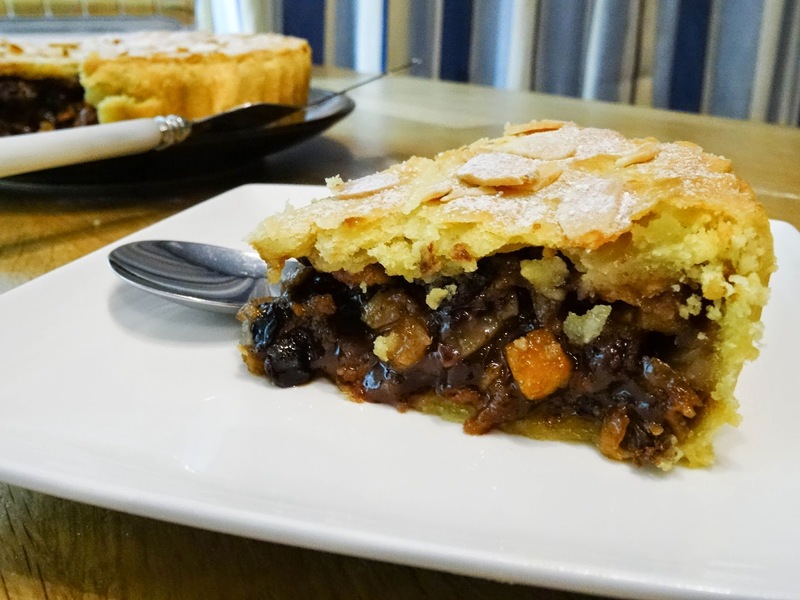 The mincemeat I used for the tart is Instant Chocolate Mincemeat, this is mincemeat that you can mix up quickly using any mixture of dried fruits you have in your cupboard you can also add nuts, the chopped chocolate adds a lovely richness to the fruit mixture. Makes approximately 2 medium jars. 1. Put the zest and lemon juice in a bowl, grate the apple including the skin, into the juice. 2. Add all the other ingredients and stir. 3. Store in a lidded jar in the fridge until ready to use. 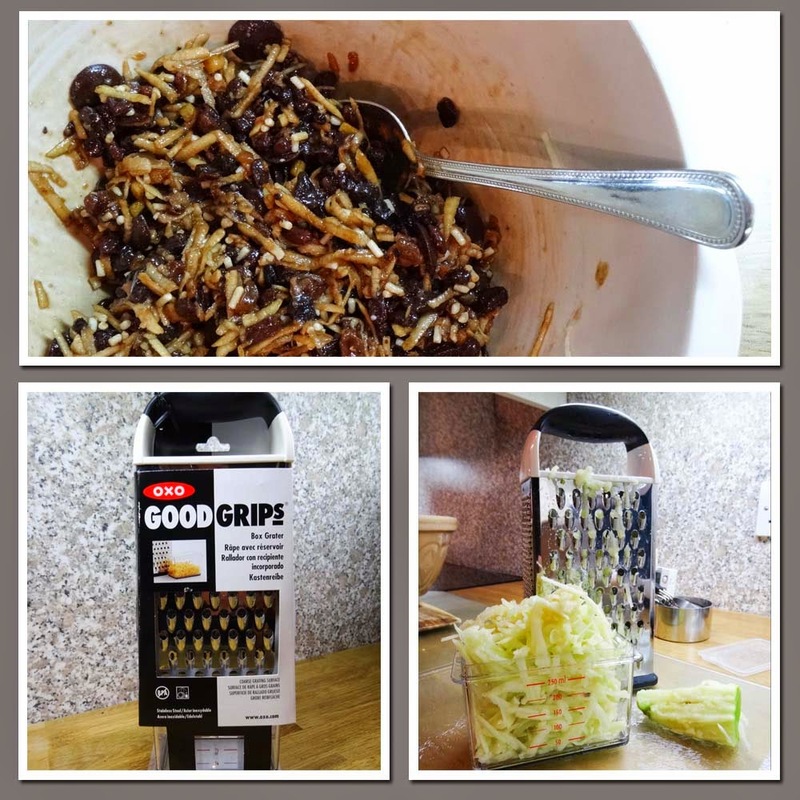 I used the Oxo Good Grips Box Grater to grate the apple. 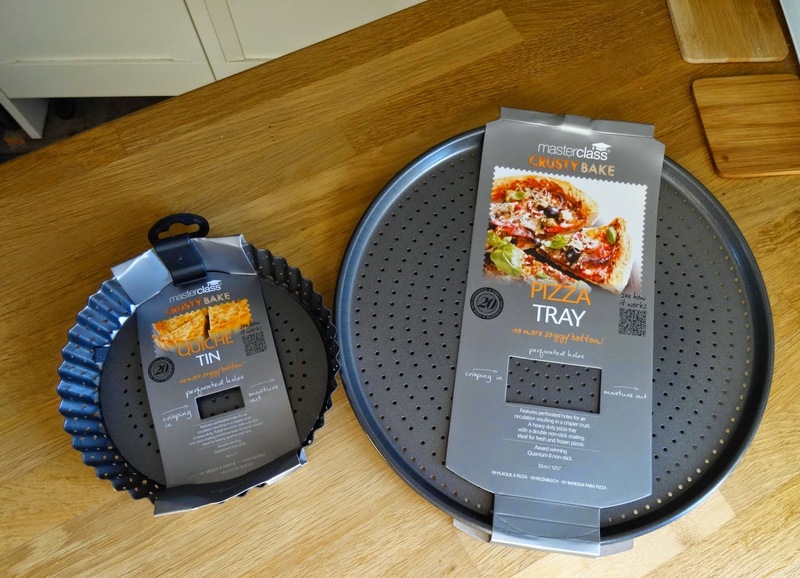 It was really quick to use and has a very comfortable handle and I love the little collection box which fits on the bottom of the grater, it even has a lid you can store whatever you've grated. 2. Separate the egg and mix the yolk with the cold water set aside the white. Work the mixture together with a knife until it comes together, knead briefly. Wrap in clingfilm and refrigerate for 30 minutes. 4. Cut off 1/3 of the pastry and put to one side. Roll out the larger piece of pastry and use to line an 18cm flan/quiche tin. 5. Fill with mincemeat, then roll out the remaining pastry to make a lid. 6. Brush the edges of the pastry base with egg white and place the lid on, trim off excess pastry, press the edges of the pastry together. Brush the top of the pastry with egg white and sprinkle with flaked almonds. I used a Masterclass Crusty Bake 18cm Quiche Tin from Kitchencraft, the holes in the tins mean that the steam escapes and there is less chance of a soggy bottom, which given that this mincemeat is quite wet, it performed extremely well. 7. Bake 35-40 minutes, or until golden and crisp. Leave for about 10 minutes to cool, then dust with icing sugar. You can do this with a sieve or tea strainer, or you can use the Oxo Good Grips Baker's Dusting Wand which is a genius little gadget which I featured in my Christmas Gift Guide. The Chocolate Mincemeat Tart did not disappoint. The pastry was crisp on the top and melted in the mouth and the fruit filling was lusciously sweet and moist with just enough tartness to prevent it being cloying. Much, much better than a mini mince pie! I'm entering my Chocolate Mincemeat Tart for Family Foodies, the blog challenge run by Bangers and Mash and Eat your Veg. 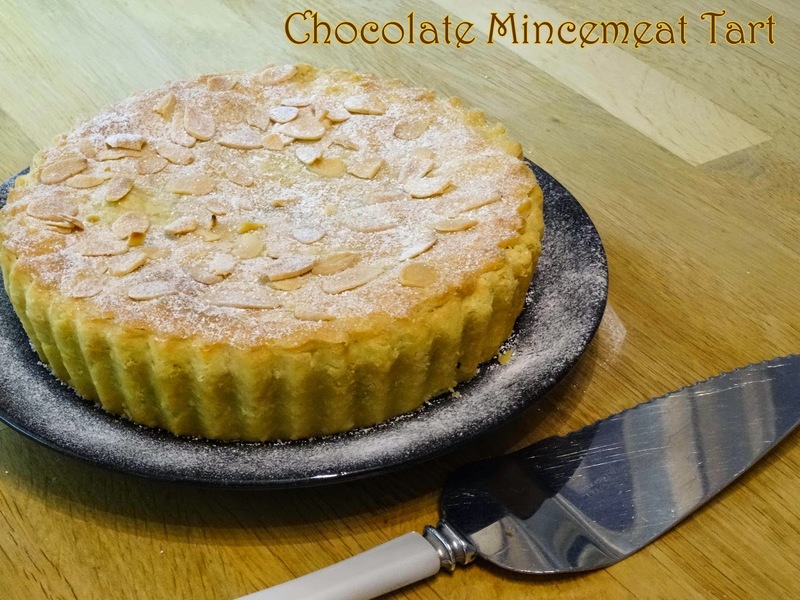 The theme is Festive Food and Mincemeat Tart is certainly a festive dessert. Well I have no seen that wand of yours in action! Your tart looks fantastic and I know how good chocolate mincemeat is too. I've just opened up a jar from last year and made some mincemeat flapjacks - wowzers they are good. I often used to make a mincemeat and apple tart at Christmas time - I'd forgotten all about it! The addition of chocolate to mincemeat sounds like a divine intervention - brilliant idea! It's surprising how many people are seeing chocolate mincemeat as a revelation, I'm sure lots of us made it last year and even the year before! It's so nice to have a big slice full of mincemeat, Amanda. Indeed, Karen bring it on! My husband described it as 'smoky' not sure I got that but it has a dark, rich taste, not too sweet either. Glad to remind you of the joys of the full on mincemeat tart, do try the chocolate it really is lovely. Chocolate mincemeat is super clever, and I bet delicious! This post has my mouth seriously watering...! The tart looks perfectly baked and sounds delicious! I have a mince meat craving now! Brilliant idea to add in the chocolate. And also I like the idea of the holes in the baking tin. I must hunt one down. Can't believe I've never thought to put chocolate & mincemeat together. This sounds AMAZING! A lovely tart Janice, and I am totally with you on the ratio of pastry to mincemeat! This pie looks delicious, you can't beat a nice deep pie, especially if it contains chocolate and mincemeat! I've never made mincemeat before, but your recipe encouraged me. I decided to leave out the chocolate, but maybe next time. I used lots of orange zest (always zest every orange and have it stored in fridge ready to add to something or another! ), and substituted whisky for brandy (hic! ), and added a few flaked almonds. Very delicious indeed. Thank you for the inspiration. Now have (well had - some already eaten) 24 mincemeat tartlets, and two jars of orange mincemeat still "stewing" in my fridge. Yum! 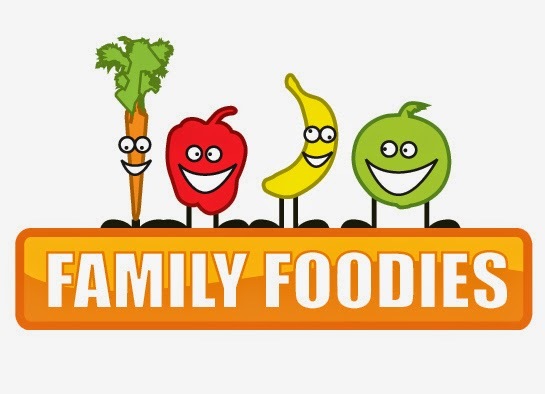 Thank you so much for letting me know, it's such a pleasure to know that you have used and enjoyed the recipe. I hope you have a very happy Christmas full of mincemeat!